There are ten days left and the campaign here in Sofia is just heating up. The situation in the countryside is very different and the level of political foul-play is almost ingenious. 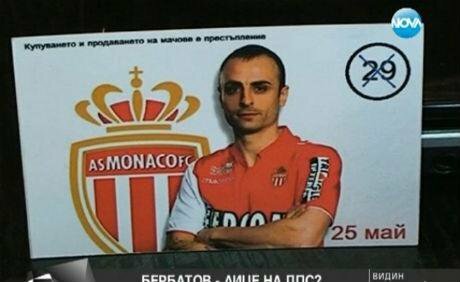 Some days ago, Dimitar Berbatov, who is a footballer at AS Monaco FC, wrote on his official Facebook page that he was shocked and dismayed at the news of his name being used (without his consent) for the regional campaign of the ethnic Turkish Party – The Freedom and Rights Movement (DPS). The party had been giving out calendars with his picture and their bulletin number in Svilengrad, a south-eastern town near the Bulgarian-Turkish border. In a similar fashion, another scandal emerged with regards to the election campaign, this time involving the pseudo far-right party Ataka. One of their videos had used footage from a private wedding ceremony without the consent of the individuals filmed. The married couple filed an official complaint after seeing their video shown on national television, while the official response by the Ataka campaign manager was that this was simply a ‘technical glitch’. Not far behind these two front-runners on how not to do politics is the newcomer party Bulgaria without Censorship, headed by former TV anchor Nikolay Barekov. 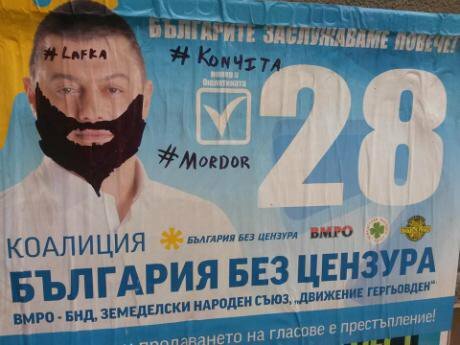 Currently, he has become the biggest anti-hero in Bulgarian politics and has even attracted the attention of student activists, who have filmed a mock rap video of Barekov and his ‘dishonest’ and ‘corrupt’ approach to the upcoming elections. His party’s campaign is as populist as it goes: Barekov promises free tablets to every student and free dental care to the elderly. Barekov’s party is also shown to have spent the largest amount of money on media campaigning – around 300,000 Euros - and has toured the country relentlessly in the past few months, staging mass cook-outs and speeches. There is an increasing debate in the (independent) media outlets as to where his party has managed to acquire such donations, with speculations revolving around the role of the Russian lobby and the infamous Corporate Commercial Bank, reflexive of the oligarchic model of Bulgarian politics. Nikolay Barekov as Conchita Wurst. Image supplied by author. In recent weeks, the lead-up to the EP elections has been marred by a series of anti-European demonstrations. On May 9th, the Bulgarian Socialist Party staged a rally in front of the Soviet Army Monument in central Sofia commemorating ‘Victory Day’ (the capitulation of Nazi Germany to the Soviet Union) rather than what is known and celebrated around the continent as ‘Europe Day’ (also known as Schuman Day, after the historic declaration by the French foreign minister Robert Schuman). 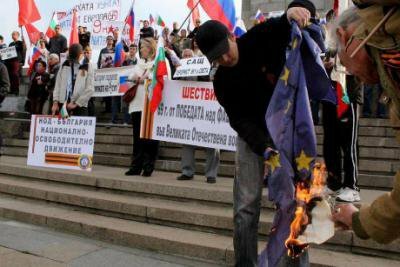 There, a European flag was burnt by a small group of demonstrators calling on Russia to protect Bulgaria and assist the nation in joining the Eurasian Union. According to recent polls, a growing number of individuals have voiced their support for the Russian annexation of Crimea and its role in escalating the Ukrainian crisis. Not long ago, Ataka publicly denounced the EU imposition of sanctions on given individuals in Russia and kicked-off their European election campaign in Moscow. The only openly pro-European contender in the race is the Reformation Block, which represents a coalition of five centre-right and right wing conservative parties. 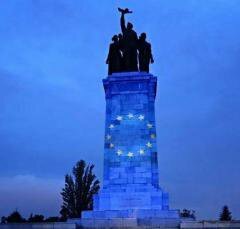 On the eve of 9 May, they also held a rally at the Soviet Army Monument, upon which a large EU flag was projected. The speaker of the Reformation Block, Radan Kanev, emphasised the ‘increasing danger’ that Bulgaria may be drifting ‘East’, away from Europe and its core values. One of the examples given was the strong Russian influence in domestic politics and the energy sector – where their push for the construction of the Belene Nuclear Power Plant and the South Stream pipe-line would effectively increase Bulgaria’s dominance on Russian foreign investment and fuel. The elections are an extremely important benchmark to nature of the political situation in Bulgaria. The #ДАНСwithme (pronounced dance-with-me) protest movement, which erupted last June, has been largely ignored. The main culprit of protest movement, Delyan Peevski, whose appointment as Head of the National Security Agency ignited the entire process of civic reengagement, looks likely to be elected as the second Movement for Rights and Freedoms (DPS) candidate. Ataka’s controversial leader, stripped of his political immunity for assaulting a foreign attaché on a plane, also has favourable outlooks of going to Brussels; the same goes for Bulgaria Without Censorship’s Nikolay Barekov. These three individuals are deeply disliked by the majority of the population, especially in more urban areas, and their presence in the European Parliament as representatives of Bulgaria is seen as deeply humiliating and dangerous to Bulgaria’s national interest. The elections will also affect the domestic political situation in the country. The candidacy of the above mentioned individuals has once again sparked a growing wave of protests in Sofia in the last week, growing as the annual anniversary of #ДАНСwithme approaches. The delicate coalition government, currently with a single-digit approval rate, will suffer even further if it once again does badly at the polls. While a resignation seems unlike, it seems that May 25 will lead to a steady increase in public dissatisfaction and outrage at the state of politics.